Chris Woodyard has always been interested in what the well-dressed corpse is wearing: a netted beadwork shroud, as worn by an Egyptian mummy; the beautiful brocades found in the royal tombs at Las Huelgas; a plain wool shroud tied at the head and foot, as modeled by John Donne in his funerary monument; or the frilled-front white shrouds worn by some Victorian ladies, accessorized with a ruffled cap. But who made these dresses for the dead? Chris is a writer, folklorist, and historian specializing in the popular culture of Victorian death, mourning, clothing history, and the spirit world. Her latest publication, The Victorian Book of the Dead, presents a myriad of Victorian funeral customs including such oddities as crape threats, tombstone censors, mourning cigarettes, and widow humor. She is the author of 11 books on historical and contemporary ghost-lore and blogs on the grim and gruesome at Killer Budgie. I have always been interested in what the well-dressed corpse is wearing: a netted beadwork shroud, as worn by an Egyptian mummy; the beautiful brocades found in the royal tombs at Las Huelgas; a plain wool shroud tied at the head and foot, as modeled by John Donne in his funerary monument; or the frilled-front white shrouds worn by some Victorian ladies, accessorized with a ruffled cap. But who made dresses for the dead? We have records of commercial shipments of shrouds from 1770s America. I remember reading, but cannot find a firm source for the assertion that ladies from the 16th through the 19th century would sew their own burial clothes when making their wedding trousseaux because women were so likely to die in childbirth. (Anyone have a reference?) And there are many news articles about elderly ladies buried in a shroud made by their own hands decades earlier. 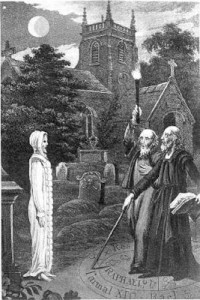 There is no doubt that the home-made shroud was a significant part of 19th-century burial customs in the United States. People also buried their dead in their own garments or nightwear. See this link for an excellent article on the subject. I have also seen notices for meetings of “Shroud Committees” or “Ladies’ Shroud Sewing Societies,” where charitable ladies made shrouds for the poor. In my search for information on 19th-century burial garments, I ran across the following articles, which discuss the labor issues, the materials, and costs of manufacturing commercial shrouds and burial robes. They are a frank look at the undertaking industry over the course of three decades. Girls Who make Good Wages and Are Contented in an Undertaker’s Shop. “Isn’t it lovely?” asked a young sewing girl, holding up for inspection something of white satin and lace. “Not much! I left there a month ago. The madame gave me too much sass and too little pay. I’m in Y___’s undertaking establishment and am earning half as much again as I did at Mme. X___’s, who is the most awful crew in this city. The season is longer, too, though of course there ain’t half the number of girls employed where I know that there were at madame’s. When I worked there I was laid off reg’lar three months in the year, while four weeks is the longest that the girls at the undertaker’s are idle. When there is a full supply of robes in stock they are put to making coffin linings, which most of ‘em like because it isn’t fussy work, though, for that matter, none of their work is half so fussy as what I had to bother with when I sewed for live people. Miss B___ (she is our forewoman) used to have the same place at a dressmaker’s, and she says she has grown ten years younger since she went into the robe making business, because she has so much less worry of mind. She sometimes used to have to keep her girls up till 12 o’clock Saturday night to finish a dress for some rich customer, and early Monday morning here would come the dress back again to be altered, and a sassy message long with it about its want of fit. Now, there aren’t any particular fit about a burial robe as you can see by this; it is made only to go over the corpse. Miss B___ says it is a great comfort to her to know that them as wears ‘em don’t make no complaint , and in the main they are becoming, which can’t be said of live dresses—I mean the dresses live people wear. “To see them in their coffins you would think they were completely dressed, but really all their finery is on top. Even the men’s solid looking black coats and smooth shirt fronts can go on and off without removing the corpse. What I am making is for a young girl who died yesterday, and will be buried to-morrow. She was to have been married next month, and her trousseau was begun at Mme. X___’s before I left there. She will look just as sweet in this robe I am making for her as she would have done in her wedding dress. “Afraid of the coffins? Not after the first day. It would be a pity if we were, as our sewing room is at the end of the loft where piles upon piles of them are stowed away. We talk and laugh and sing, just as we did at Mme. X___, and Miss B___ is an awful lot nicer than the freewoman we had there, because, as I have already said, she isn’t being constantly worried out of her life by fussy ladies; and, as it is piecework, she never has to scold the girls for loafing. She says that what she can’t get used to is to have to go downstairs and take orders for robes for folks that still have breath in their bodies. Some people seem to be in an awful hurry to get their dead put underground. This next article may be one of the the earliest mentions in the press of machine embroidery—the shroud seamstresses ingeniously created patterns with their regular sewing machines. “Sweet Things” in Shrouds, and Trimmings—“Ladies’ Fine Lawn Robes”—“Ladies’ Cashmere Habit”—“Style No. 37”—The “Forelady’s” Role. Every dress intended expressly for the dead may be styled, generically, a shroud. Modern usage, however, makes a distinction according to the color of the dresses, applying the term “Shroud” to those which are black or white and “habit” to those of brown material. Only black, white or brown material is used. There are large shops for the manufacture of dresses for the dead, as for clothing for the living. The manufacturer sells to the undertaker. He usually makes coffins and coffin trimmings, and everything he sells to the undertaker is, as a rule, sold for just half of the retail price and often for less than half. A lawn shroud that is retailed to the mourner for $2.25 costs the undertaker, usually 90 cents. The undertaker often waits for his pay, and frequently he doesn’t survive the waiting time. So he makes his sales on a basis of large margins of losses. In that way he manages to counteract the effect upon him of the grief that he sees, and he doesn’t die of sorrow accumulating within him. In the larger manufactories from which the undertaker gets his supplies, from seventy-five to one hundred different styles of shrouds for dead women are shown, and fifteen or more for dead men. The materials chiefly used are merino and lawn. The trimmings are satin, plain, stamped, or quilted; gimp, in folds, puffings, bows, edgings, box plaits, ruches or crepe lisse and of other material, embroidery and raised flosswork representing flowers, vines, tendrils, and in mottoes. The styles of cut and making follow to a considerable extent the prevailing modes of dress for the living. The morning dress pattern is largely used for women, and the dressing gown for men, invariably with a bosom piece. For men it is the usual shirt bosom and collar of starched linen, often with studs; for women the bosom piece is made according to fancy, regulated largely by the material of the robe. The frequent use of the patterns above mentioned may be due largely to the fact that they are easily put on, because of their large sleeves and loose fit. They are open at the back from top to bottom and, when put on, are fastened at the neck. The sides are simply tucked underneath the body. Garments worn in life are frequently used as grave clothes—a custom more prevalent in New York than anywhere else in this country, with the possible exception of Deadwood and some other places, where sudden deaths and unceremonious burials are rather the rule. Boston uses twice as many shrouds proportionately as New York, which does not require more than could be furnished by one or two manufacturers. The greater number of the shrouds made by New York manufacturers are sold in other cities…. The least costly shroud is of black lawn, and it sells at retail, ready made, for $2.25. It is trimmed with the same material, in puffings, bows and tulles. Lawn burial robes are little used compared with those of other materials. Prices of shrouds vary from that of the simple robe, already mentioned, to $40 or more. The more usual prices are $10, $12 and $15. Manufacturers of shrouds, coffins and trimmings do not sell at retail…. In a long, narrow room—nearly 200 feet long—in the second story of a manufactory of undertakers’ supplies, were shown shrouds for men and for women, in great numbers and various styles. A shroud of new design, was of black merino, with “cross-crease center” of black satin folds, trimmed at the side with box plaits and milliners’ folds, alternately of satin and Merino. Folds of the same kind around the neck enclosed a satin-threaded crepe lisse ruche. It was finished at the throat with a black satin bow. The end of the sleeve was trimmed to correspond, and was softened with crepe lisse. In an open box on the counter was a brown habit. The bosom piece was of white satin, with finger puffs up and down. There were gimp and edging at the sides, and box plaits, with edging; around the neck, white satin bows, finished with trimming. A man’s shroud was in another box. It was trimmed with quilted satin and raised floss work in the shape of a cross and a leafy vine. There were a linen bosom and collar, and a black cravat and bosom studs. TA fold of satin answered for the vest, and the shroud had the appearance of an elaborate dressing gown for a gentleman. Another shroud for a man had a matelassé front, a shirt bosom of another pattern, and folds to represent a vest showing two buttons. The shelves behind the counter were filled with boxes of burial robes and “head linings.” They were labeled “Ladies’ fine lawn robe;” “Ladies’ cashmere habit, No. 25 front, color brown,” Cashmere robe, No. 35 front, color white;” the number designating the style of the robe. An “old lady’s shroud” was in one of the open boxes. It was of black cashmere, with folds crossing over the breast, the second fold narrow and of black satin; pointed sleeve cuffs, bound with black satin; folds of white lawn crossing diagonally to the left, across the breast; a lawn bow at the throat and at the wrists and around the neck a widow’s ruche. “Style No. 37” was somewhat costly. The material was fine brown merino. Double puffings were edged with white satin and edged again with a ruche of rule. The plain white satin breast piece had “daisy buttons”—buttons with white satin center and loops of white silk thread around it—down the middle. At the throat was a white satin bow, edged, and around the neck a tulle ruche. The robe retails for $30. Quilted to the bottom it would cost $40, and a cord and tassel would come with it. Quilting is a more expensive trimming than puffing, for more time is required to make it. Ordinarily, a shroud has about two feet of trimming, and the cost is about one third as much as when trimmed to the bottom. This next article is interesting in that it states that there is a particular apprenticeship period to be served because dressmakers don’t necessarily know how to make shrouds. A THOUSAND GIRLS HAPPY IN A STRANGE OCCUPATION. The Shroudmakers of New York a Distinct Class of Needle Plyers—Clothing for the Dead—Various Designs, Grades, and Fashions. There are over one thousand well fed, well dressed, well paid young women in New York city who earn their living making shrouds for the dead. The “Song of the Shirt” was not written for them. They sing no songs with voices of dolorous pitch, and indeed they have very little reason for doing so. Their songs are as merry as the day is long, and are sung to the busy hum of sewing machines. Less doleful melodies it would be hard to find. The shroudmakers of New York form a distinct class of bread winners. They differ from other needle plyers as essentially as silversmiths differ from locksmiths. An experienced shroudmaker may know how to make a dress, but a dressmaker has little or no knowledge of how a shroud should be constructed. This part is emphasized whenever a dressmaker secures employment in a shroud factory. Before she is able to earn the regular wages of her craft she must serve an apprenticeship, the length of which depends solely upon her aptitude to learn the peculiar knack of this strange trade. There are twelve well known firms in this city engage id in the manufacture of shrouds, and it is in their factories that all the work is done. The wages are well maintained, although fixed by no union, and employment is guaranteed the year through, for the sale of shrouds is not marked by any of the fluctuations which are noted in some other branches of manufacture. New York is the recognized headquarters of the clothing of the dead as well as of the living. There is mothering about a shroud factory to indicate the character of its product. Even the rows of coffins and enticing varieties of caskets in the ware room below seem to belong to another business altogether. The showcases that are visible from the head of the stairs, with their display of the latest styles in shrouds, appear to have been left there, perhaps by some pervious tenant, and bear no possible relation to the use the rooms are now being put. It is very difficult to imagine that these light hearted girls who chat so merrily over their machines are turning out burial robes by the dozen, but such is the case and to them the work is no more dolorous than the making of shirts. If you are curious come with me to one of the largest factories in the city, within a few blocks of Cooper Union, in the Bowery, and see for yourself. As the door of the shop opens the noise is almost deafening. Between the clatter of the machines on the one hand and the chatter of the girls on the other, one can hardly hear himself speak. It is 10 o’clock—early for us, perhaps, but not for the girls. They have been at work since 8, and one-quarter of their day has already been spent. 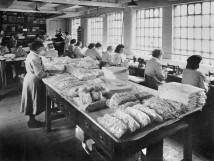 In the center of the room is a double row of sewing machines, varying in size and power, and all fastened to two long and narrow tables with little round places cut in the sides into which the operators snugly fit. At the other end of the room are several counters forming a quadrangle. Within this square sit a dozen young women chatting and sewing, while a tall, middle aged, motherly woman snips out of yards upon yards of black, white, and brown cloth patterns of shrouds. Shrouds with long skirts, shrouds with short skirts, shrouds with no skirts at all. Shrouds for the rich and shrouds for the poor. And such patterns they are. This elaborate design in white satin, with soft ruching around the neck and fleecy ruffles around the wristbands, is modeled after a wedding gown as nearly as is possible considering the different use it is to be put to. It will grace the funeral of some rich patron of a fashionable undertaker. This plain black garment, with a false shirt bosom and a collar which ties behind with a cord, is patterned after an evening suit. It is quiet and eminently respectable. It is intended for a man of middle age and costs quite as much as a suit worn in life. Besides these there are robes of brown and combinations of brown and black, some faced with satin, some with silk, and others plain even to severity. These form the cheaper grade of goods and are worn by men or women of advanced years. The white robes are all intended for the young. Some of these are marvelous pieces of work, and if embroidered by hand would cost a small fortune. This little gown would hardly reach from your hand to your elbow. The tiny neckband is ruffled and tied together in front with a white satin bow. The little sleeves are covered with embroidery and the skirt is elaborately trimmed with lace. It is a baby shroud and is the smallest size that is made.